Josiah is the boy taking off running without any ski poles. Analise is skiing next to my wife at the back. 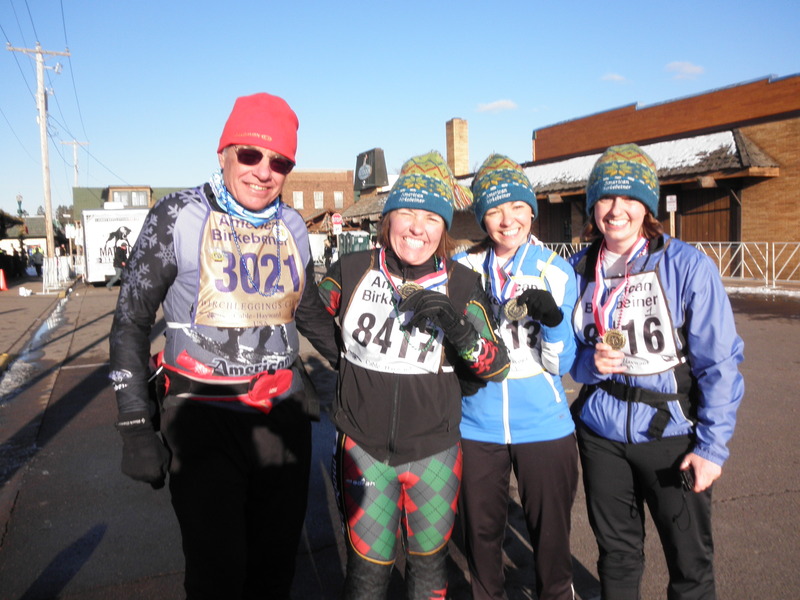 One of the things that my wife and I connected on when we first met each other back in 2001 was the similarities between her cross-country ski racing and my bike racing. Kristine first started to ski when she was only 2 or 3 years old. And she would ride in a backpack with her father skiing even earlier than that. Through elementary, middle, and high school, Kristine ski raced in the winter eventually earning a full scholarship to the University of Wisconsin, Green Bay to ski collegiately. I didn’t start bike racing until high school and college, but I dove right into it so that I experienced many of the same things she did: from the travel with a small group of guys usually to a very rural area, parking in fields (snow covered fields for her), and then taking your body to the limit racing against others. Also, the training – most skiers run or bike in the off-season to maintain the aerobic fitness required to excel in the sport. Up here in Wisconsin, many serious bike racers (Greg Lemond for example) switch to cross country skiing and ski racing to maintain aerobic fitness for biking when it finally thaws out late into spring. In Alabama, I’m fortunate to be able to ride year-round. Part of the adventure of biking for me is the ability to travel from point to point and explore new places so much more efficiently than if you were running. Skiing has the same allure because you are able to travel through the woods and explore trails much more efficiently than snow shoeing. As far as the racing goes, I’d compare the ski racing more to mountain bike racing or cyclocross racing on non-technical courses with more of a notion of “getting the hole shot” and pushing yourself mostly alone or chasing one or two skiers just up the trail without as much drafting as in road racing. Still, there is a drafting component particularly at the elite end of the sport where the speeds are much closer to 20mph than 10mph, and there tend to be large groups of skiers able to maintain the same speed throughout the race. The tactics are different because of this, but you still see skiers attack each other and change pace to try to drop the others. Cross-country skiing at the winter olympics is by far my favorite winter sport to watch … not the least because of the way the skiers push themselves to the absolute limit. In any close cross country ski race finish, the skiers will fall over as soon as they cross the line because there is not enough energy left in their muscles to support their body weight. Cyclists push themselves similarly to that extreme, but because we aren’t standing up we can usually manage to keep the bike upright as it coasts to a stop. Although in one close finish this past year, three of us sprinting at the end of the 105 mile Rouge Roubaix race all fell over on the side of the road into a grassy yard … completely spent, utterly exhausted, but also undefinably happy – and we were only sprinting for 2nd place! Of course, I buck the trend a bit when I visit from Alabama … bringing my mountain bike and enduring the cold weather for a week in some truly epic rides rather than cross country skiing. Today I’m traveling point to point to Heartwood cabins where Kristine and I had our wedding reception back in the summer of 2003. We’re going to spend a few days up there so Kristine and her dad can do some good cross-country skiing on the trails up there … while the kids enjoy ice skating, sledding, and a little bit of skiing. I’ve got a three hour ride planned to get there today, and then a couple four to five hour rides planned for the next couple days taking me through the snow mobile capital of this area (Danbury, WI), and across the St Croix into Minnesota. Heartwood looks completely different in the winter covered in snow, but that’s the beauty of the northwoods – each of the seasons up here transforms the land into a completely different amazing world. 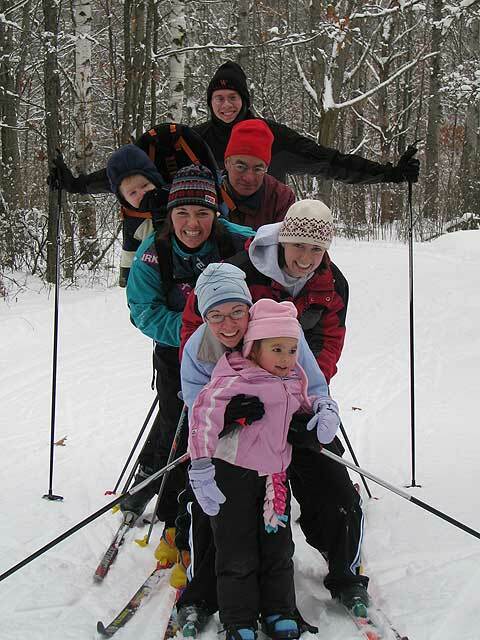 Family ski 2007 – from front to back – Analise, Aunt Anna, Aunt Kat, Kristine, Josiah, Papa Dale, and Uncle Hal. I was out there too, but I took the picture. This entry was posted in Off-season, Racing and tagged skiing, videos on December 28, 2012 by kartoone. In my post yesterday about my 176.5 mile end of the season epic ride, only uploaded a few of all the videos I took. Here are the other ones, including roller coaster road and a short clip of the climb through the fog up NC-215 to the parkway. This entry was posted in Training and tagged videos on October 9, 2012 by kartoone.